He Is My All is a ten-week journey where you will encounter a God who treasures you. This study explores the hope, healing, and life-changing power found in His perfect love. Each day's selection features room for your thoughts, allowing you to journal and meditate on your personal journey. You'll find a God who loves you completely, experience His life-changing power, and embrace a deeper relationship with your heavenly father. 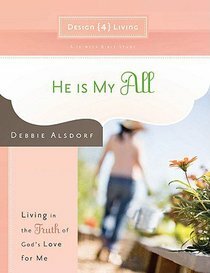 About "He is My All (#01 in Design4living Series)"
Debbie Alsdorf holds Design4Living Conferences and speaks with Hearts at Home. She is a member of the American Association of Christian Counselors and is director of women's ministries at Cornerstone Fellowship, where her Bible study is attended by 700 women every week. She is the author of Deeper and A Different Kind of Wild.Alsdorf lives in Livermore, California.